Thanks so much @treblekicker I always need to ask when I see something I haven't seen before. Great score! Great photo and figure. I don't remember it's origin @treblekicker when was it released? I assume it's a one-off? Size? So many questions! There was a Friday June 19ths in 2009, so I'm guessing that was the release date. Size is probably about 5". more info here on vinyl pulse, i also regret missing them! I picked up one of these guys back in the day. And yes, he has a big unit. D-.No, treblekicker, Kerk1 and 2 others like this. I picked up one of these guys back in the day. And yes, he has a big unit. Don't know how I missed this thread till now, but I did. Thanks so much for posting all these pics. 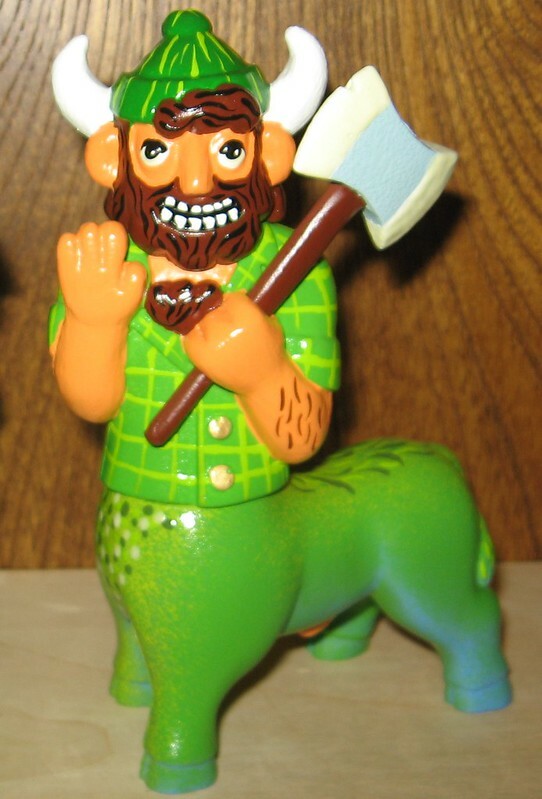 that first larger descrpition of Bunyan the ox sounds about right. Arne sculpted and did hand rotocasting of this, and did a stellar job. D-.No and trueadrn like this. wingnut0, SHred, Spaceman Yells and 4 others like this. 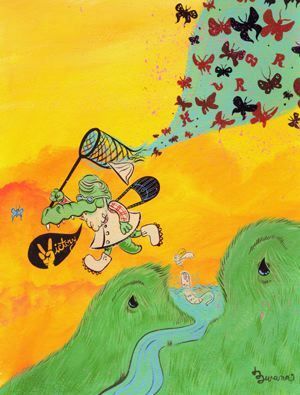 I've got this original painting that I bought at a show in NYC in 2008 from Bwana. It features Edward asleep (and drunk?). I like how you can see Steven in Edward's dream. 1. Do you have any original paintings that feature Steven & Edward together? And would you be interested in selling? 2. Do you think Bwana would be open to doing commission work that includes the two of them? 3. I could swear that the image in the vinylpulse.com link above is cropped and that the full image includes Steven trying to escape Edward's net. Anyone have a link to the full image? D-.No and Brooklyn_Vinyl like this. Spaceman Yells, Brooklyn_Vinyl and animator like this. I grabbed a blind bag at Dcon this year, and got a Quiller. While I was hoping for an Aqualox, I love the Quiller figure. 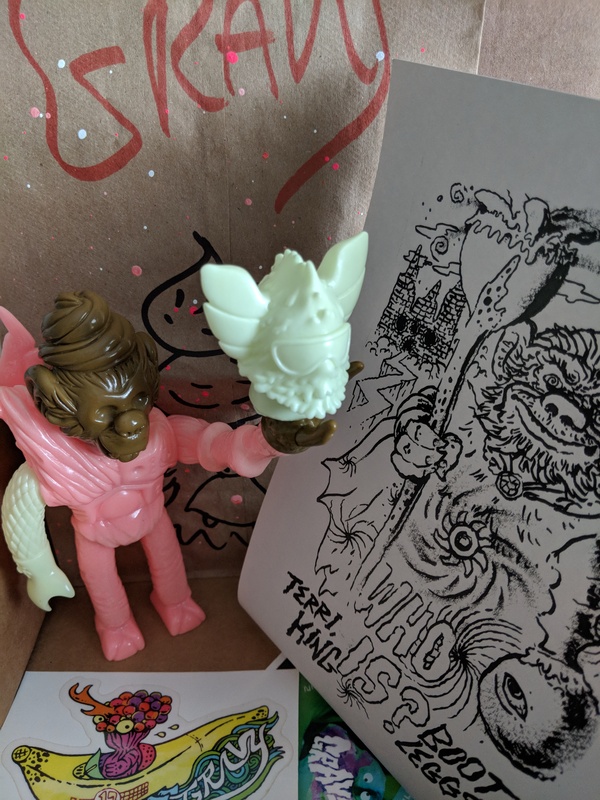 When Bwana offered the remaining blind bags online, I went for it and managed to grab another Quiller. Haha. D-.No and super77m like this. @amc3 Google tells me that image from vinylpulse is from the "Welcome to Forest Island" book from Top Shelf. I can look at my copy tonight and see if there is a larger image inside, but based on the dimensions I think it's the full image. BTW, if you don't have a copy, even though Top Shelf says sold out, it's pretty easy to find. I got a few bags after the Con and was really happy with my pulls. 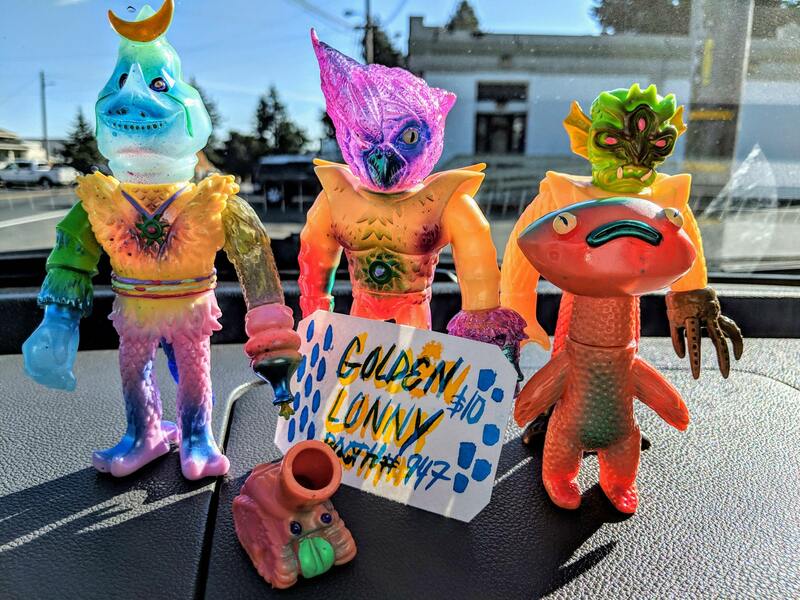 Super stoked on the Golden Lonny ticket! The Palo Don is gorgeous and a VERY welcome surprise. The Quiller was my first choice of figures, the purple lame vinyl is awesome. Speaking of, I love the Aqualox but if anyone got a Hooligan they either want to sell or trade for Aqualox, I'm your guy. D-.No, zindabad, Kerk1 and 2 others like this. If anyone would rather have a Quiller than the Aqualox for their Hooligan, give a shout and we can get a three way trade going. Here are my guys from DCon. I pulled an Ugly Stardust and won a Golden Lonny on the Friday. I was Winner No.1 apparently. YES!! WOOHOO! Anyway, these dudes are fun. Ugly stands like a giant among the other Suns. animator, wingnut0 and Brooklyn_Vinyl like this. ^ I was surprised more people weren't coming forward with a win. There is still 1 unclaimed Lonny! The Lonny is so good. The gold accents on the ears(?) and hands are a nice touch. How many sold/won at the show? 2 winners at dcon, 2 winners after. All good people. Now I bought another. Ugh. I'll be trading my second Ugly Stardust for anyone else, preferably Hooligan, if I get a dupe. You've got better odds of getting the Aualox via trade as well if you get a Hooligan. You know where to find me. D-.No, animator and Brooklyn_Vinyl like this. Who wants to trade an Aqualox for a Quiller?! spatula007 and patrickvaz like this.